This elegant Teapot for Two (or personal teapot!) 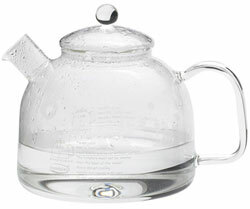 features a large German glass, removable infuser and German Glass lid to easily brew your favorite tea. Once your tea is at its peak flavor, remove glass infuser and enjoy! Made with German made heat-resistant borosilicate glass! Size: 13.5 oz. Dishwasher safe. Organic Living Supplies Delivered with FAST, INFORMATIVE & FRIENDLY service for 30 years!